The Peace Laboratory, established in 1971, occupies a site which originally housed a section of the Hal Far airfield. A British construction, the complex comprises a sanctuary and chapel, as well as several associated structures, and is surrounded by extensive, landscaped grounds. The need for intervention was recognized when damp was noted on the chapel soffit. An in-depth inspection revealed that as the British-period roof membrane expanded, and ponding occurred, water seeped in beneath the protective layer, which consequently detached. Water was eventually absorbed in the voids of the concrete ceiling slab. The major ramification of this was the rusting and resultant deterioration of the steel reinforcement. As oxidization of the steel occurred, the reinforcement expanded, causing the concrete to crack and fall. The contoured configuration of the slab was such that it aggravated the situation and thus the structural stability of parts of the building was compromised. Remedial measures were taken immediately. 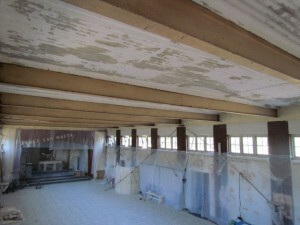 Once the soffit and supportive wooden structure were removed, the formwork was flattened and the steel was cleaned and brushed in order to expunge all debris. Following an application of sealant to the damaged reinforcement, Sika Rap material was applied at intervals and in several layers in order to reinstate the concrete cover. The opportunity was taken to design a contemporary soffit and lighting layout which is complementary to the rectangular configuration of the chapel and representative of the religious values which it represents. 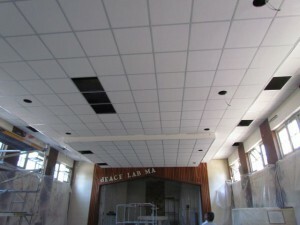 As a result, the complex was not only secured structurally but also be given a new outlook which better relates the ethos of the JOHN XXIII Peace Laboratory. The estimated cost of works on the Peace Sanctuary, the central chapel of the complex, is €46,000. The Peace Lab is active in a range of initiatives, including interfaith and intercultural edu­cation, environmental issues and social work. For funding, it relies on voluntary work and contri­butions as well as fund­raising activities.